Last season, Newcastle finished in the top four. This season, they lie in 9th, with just one win from their four games after last night’s defeat to Exeter. Looking at their points tally objectively, one would say that Newcastle are struggling, perhaps suffering from ‘second season syndrome’. But in truth, that is far from the truth. They’ve played both of last season’s finalists, and competed admirably against both; it took Saracens 76 minutes to pull ahead, while Exeter were pushed all the way (the Chiefs have breezed through their three other games). That said, with Wasps to come and the prospect of top-tier European rugby meaning that their key players can’t have a break, Newcastle will need to improve if they’re to be competitive in the Premiership this season. Meanwhile, Exeter looked both effective and accomplished, and it’ll take quite the team to stop them this season. Sadly, we’ll have to wait until Christmas time until they face Saracens. With Exeter and Saracens both with perfect points totals heading into round four, Wasps’ game against Sale (who they haven’t beaten in Manchester since 2010) was vital to prevent a gap opening up at the top of the table. As it happened, they had little to worry about. 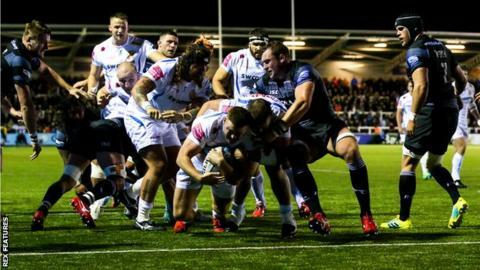 Sale failed to take their opportunities despite huge amounts of possession and territory in the first half, and Wasps won easily, securing a bonus point victory in the closing stages. Wasps’ defence was woeful in the first half, but held strong after the interval, and if they can stop missing tackles they could compete with their two high-flying rivals. Sale will be nervously awaiting the return of their star players from international duty, injury and suspension. When Harlequins battered Sale in the opening round, they were greeted by mass adulation, causing some to suggest that Quins may even push for a top-six finish this campaign. Three games later, it’s a very different story. They were dominated by a transitioning Northampton side, only saved themselves from humiliation against Bath by virtue of a late surge, and lost to promoted side Bristol today. Having flirted with the drop last season, one must wonder whether Harlequins are heading for relegation. With games against Gloucester and Saracens in the next two weeks, Harlequins could well be bottom of the table when the Premiership breaks in late October. It was a vital victory for Bristol, who now look as if they can secure safety in the coming weeks with games against struggling Northampton and other relegation rivals Worcester as their next two fixtures. When Tom Collins scored at the death to give Dan Biggar the opportunity to level the scores with the clock dead, it looked as if the metronomic Welshman would get his side a draw. But Biggar’s kick hit the post, and Northampton had to travel back to the Midlands with only a losing bonus point for their troubles. Though there are encouraging signs for the Saints in how they compete so admirably every week, it’s essential that Chris Boyd’s men start picking up the points in tight games. Bath look resurgent, and are unbeaten since their opening day defeat to Bristol, and Joe Cokanasiga looks to be fulfilling his hefty potential on the wing. Was Eddie Jones’ decision to leave out Cipriani that fallible? England’s training squad was announced this week, but surprisingly (but dare we say it, understandably) there was no place for Danny Cipriani. The Gloucester fly-half has drawn both good and bad headlines in his short time at the Cherry and Whites, and Jones’ decision was met by widespread vitriol. But perhaps it was the right call. Jones has made no secret of his desire for a fly-half who can control proceedings, even when their forwards aren’t winning solid ball. Cipriani hasn’t been able to do so, as Read About Sport pointed out a couple of weeks ago. Watch out for a big performance from Cipriani on Sunday, as his Gloucester side travel to Saracens for a crunch clash with the Champions.